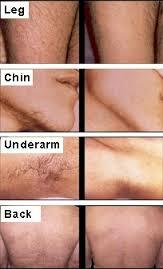 Shaving is best for leg, underarm, and men's facial hair. It can, cause ingrown hairs, especially in the pubic region and on the face. It will turn the skin gray and make the hair grow back thicker and darker. And, it stimulates the hair to grow. Plucking or tweezing can be painful, but it may be a good option if you only have a few hairs you want to remove temporarily. Times when you might want to pluck include when you're reshaping your eyebrows or pulling out a few stray hairs that appear on your face. You should not, however, use this hair removal method for large areas. It can cause ingrown hairs or scarring. Hair removal creams, also known as depilatory creams, are messy and is temporary. They're not all the same, so be sure to read the label. For instance, you shouldn't use a hair removal cream made for pubic hairs to remove hair on your face. The chemicals in these products dissolve the hair shaft. Using a cream improperly -- for instance, leaving it on too long -- can burn your skin. If you have a history of allergic reactions, you should first test a little bit of the cream on a small area on your arm to make sure you don’t have a bad reaction to it. This is one of the longest-lasting methods, but still temporary. It generally requires four or more treatments, 4-6 weeks apart to diminish the hair. It can only be effective on dark hair and light skin. People with darker skin tones have been seriously burned. The laser beam or a light pulse works to destroy the hair bulb. The treatment is expensive and sometimes painful, like a sunburn. Be sure you select a doctor or technician who is highly trained and knowledgeable. You can do this at home or you can have it done by a professional in a salon. Hot waxing can be messy and painful and may leave some hairs behind because they can break off. Infection is one side effect to watch for. If the wax is too hot, you may get a burn. You should not use this method if you also use certain types of prescription acne creams (such as Retin-A) or take isotretinoin. If you do, the wax will pull your skin off. It is not recommended for eyebrow shaping. It is too easy to remove the wrong or too many hairs. This hair removal method will make the hair grow back stronger.